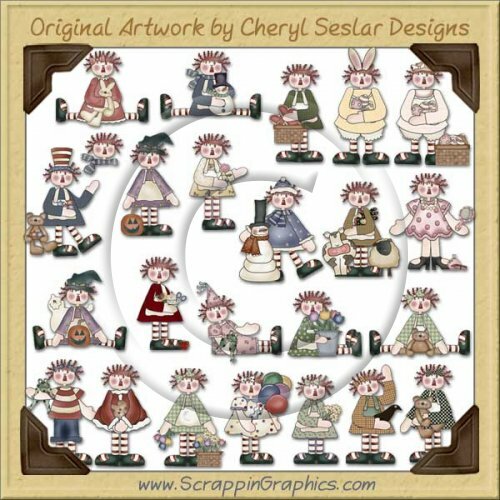 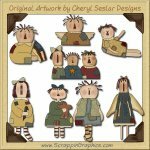 Another great Raggedy collection from Cheryl! 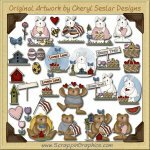 This collection of charming graphics is perfect for all different kinds of children's seasonal projects. 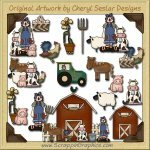 This set includes 35 different graphics : 11 coordinating backgrounds, Raggedy Annie holding teddy bear, Annie sitting with snowman, Annie with basket full of hearts, birthday Annie, Annie with bunny, Annie with crow, Annie holding daisies, Annie all dressed up, Easter Annie, Easter bunny Annie, farmer Annie, Annie with flower bucket, Annie with flowers, Annie head wearing scarf, liberty Annie, princess Annie, Annie holding rose, Santa Annie, Annie at school, Annie sitting with teddy bear, tomboy Annie, witch Annie, sitting witch Annie, Annie snowman. 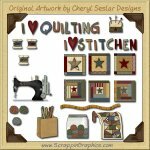 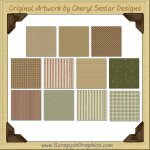 Great collection for making little girl scrapbook pages, cards, labels, tags, invitations, and other printables.